EUGENE, OR – After 54 volumes of the well-received Memories of Srila Prabhupada series, ITV Productions has announced that it will immediately begin production on Memories of Memories of Srila Prabhupada, a new DVD series to preserve the memories of devotees as they recall their first viewings of the Memories of Srila Prabhupada series. While the exact release date of the early volumes of the original Memories of Srila Prabhupada series remains shrouded in mystery, several devotees can still recall their first viewing. Keeping with their tradition of interviewing controversial devotees like Kirtananda das and Hamsadutta das, ITV plans on devoting an entire volume to Vraja Kishor das from the famous straightedge krishnacore band 108, who first viewed the series in the early 90’s while on tour with Shelter. 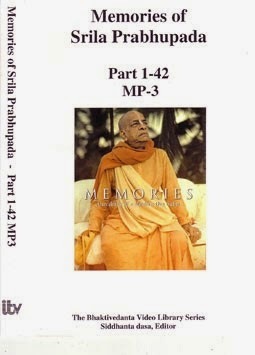 The Memories of Memories of Srila Prabhupada DVD series is projected to span 54 volumes, bringing this entire Prabhupada series total to an even 108, thus making it auspicious.